The Conrad Prebys Music Center features one of the finest small concert halls in the world. The Music Center, located in the heart of campus, is a destination facility that will serve as a bridge to the San Diego community. Rand Steiger, chair of the UC San Diego Department of Music, is the visionary behind the new Conrad Prebys Music Center. UC San Diego’s new $53 million Conrad Prebys Music Center, the new concert and office venue for the university’s Department of Music, features state-of-the-art teaching, rehearsal, practice and recording studios, and world-class performance spaces including a 400-seat concert hall designed by Seattle-based LMN Architects in collaboration with world-renowned acoustician Cyril M. Harris. The destination facility is located in the heart of the campus, and will serve as a bridge to the San Diego community. 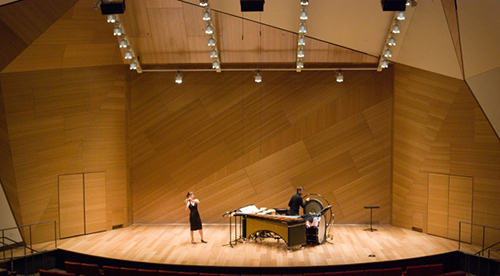 Opening concerts, May 8 and 9, will feature performances and compositions by distinguished faculty members—including works by Steiger, Philippe Manoury, Pulitzer Prize winner Roger Reynolds and Guggenheim Fellowship recipients Anthony Davis and Lei Liang, along with performances by Aleck Karis, Susan Narucki, Steven Schick and others. Works were chosen to highlight the special qualities of the extraordinary Conrad Prebys Concert Hall. Friday, May 8, 7:00 p.m.
Saturday, May 9, Noon-4:00 p.m. Ticket information and other details are available at http://music.ucsd.edu. The Music Center at UC San Diego was made possible, thanks in part, to the vision of Steiger at the university’s Department of Music, and the generosity of local philanthropist Conrad Prebys. “Music is a true passion of mine and has been a great part of my life,” said Prebys, a one-time aspiring musician. The San Diego builder demonstrated his love of music in May 2007 by making a $6 million donation to the university, which enabled UC San Diego to continue building the facility, now named the Conrad Prebys Music Center in his honor. A year later, he made a $3 million gift to support the renowned UC San Diego Department of Music with the establishment of the Conrad Prebys Music Endowment. “This venue is where music’s most exciting innovations are happening—and I’m proud to be a part of it,” added Prebys. Other donors providing private gifts to complete the facility include Joel and Ann Reed, Elaine and Murray Galinson and San Diego National Bank, among others including a generous anonymous donor. Situated on the UC San Diego campus at Russell Lane, the new Music Center will become a vital part of the campus Arts District, following a “neighborhood plan” that unifies buildings through connections to public spaces and walkways, and architecture featuring appropriate proportions and design details. The concert hall’s stunning interior is an asymmetrical system of triangular wood and plaster surfaces that fold around the room to richly diffuse sound throughout the space. Built of cast-in-place concrete and aluminum/glass curtain walls, the Music Center also includes an innovative small theater with electronic virtual acoustics, a 150-seat lecture/recital hall, and rehearsal rooms for chamber, choral, orchestral and percussion music. For more information about the Conrad Prebys Music Center, including the opening event schedule, background, video and more, please visit http://music.ucsd.edu. Founded over 40 years ago, the UC San Diego Department of Music today spans a spectrum of music from classical to contemporary, including jazz, Hindustani, computer and experimental music. The faculty has included many distinguished composers, performers and scholars who have been recognized with such prestigious awards as the Pulitzer Prize, the MacArthur “Genius” award, Guggenheim Fellowship, the Grawemeyer and Grammy. The department was designed to provide a unique environment in which composers, performers and scholars collaborate and engage with the most vital ideas and newest technologies in order to push the boundaries of contemporary music. Undergraduate and graduate students from the UC San Diego Department of Music have gone on to successful careers in fields ranging from performance, composition, research and education. Please visit http://music.ucsd.edu for more information. Founded in 1960, the University of California, San Diego is ranked the 7th best public university in the nation by U.S. News and World Report, and has been named the “hottest” institution to study science by Newsweek. But with higher education’s share of state revenue declining each year, UC San Diego must increasingly rely on financial support from private sources to pursue groundbreaking research and cutting-edge technologies. With the support of generous alumni, parents, faculty, staff, students and friends, our campus can continue to provide local impact, national influence and global reach as one of the world’s leading education and research institutions. For more information, call 858-534-1610 or visit www.giving.ucsd.edu.